The Russell Westbrook Why Not? 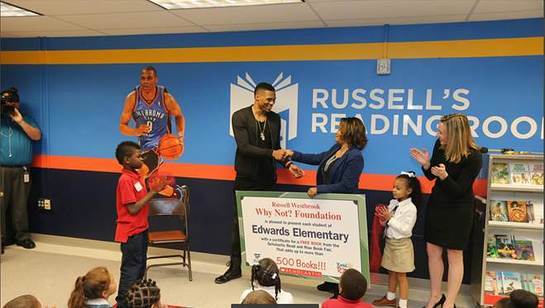 Foundation continued its support of youth literacy with the unveiling of the 7th Russell’s Reading Room this week at Edwards Elementary School in Oklahoma City. 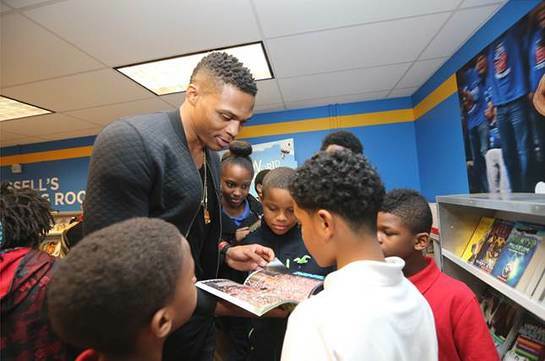 After the successful launch of three reading rooms in Oklahoma City and an additional three reading rooms in Los Angeles last year, NBA Star and Philanthropist Russell Westbrook is kicking off 2016 by continuing to inspire children to read. In addition to cutting the ribbon on the 7th Russell’s Reading Room, the Why Not? Foundation and Scholastic hosted a book fair at Edwards Elementary School. Russell Westbrook presented Principal Patrice Allen with a check covering the costs for every student to take a book home from the fair. 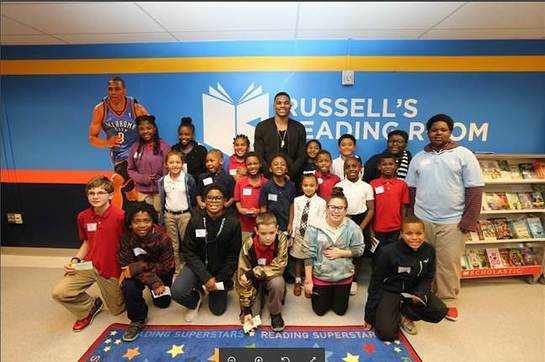 In an effort to expand its literary initiative, the Russell Westbrook Why Not? Foundation, in partnership with Scholastic, will now sponsor school-wide book fairs at every school that receives a reading room and make sure every child goes home with a book. Russell’s Reading Rooms encourage education and reading in a safe learning environment, and by bringing book fairs to schools the Why Not? Foundation is helping children build their own personal libraries and develop a lifelong love for independent reading. 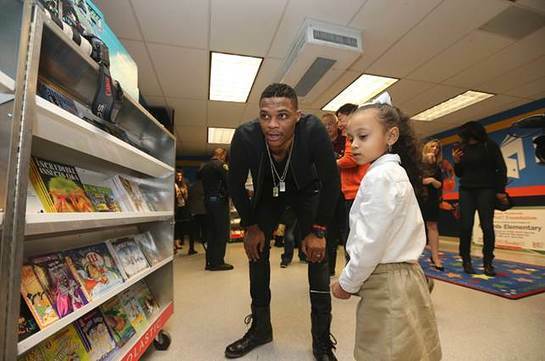 Westbrook has always stressed the importance of education and creating a safe learning environment, and through the continuation of the Russell’s Reading Room initiative he remains committed to providing a nurturing space for children to develop their reading skills at school and at home.